Hey! 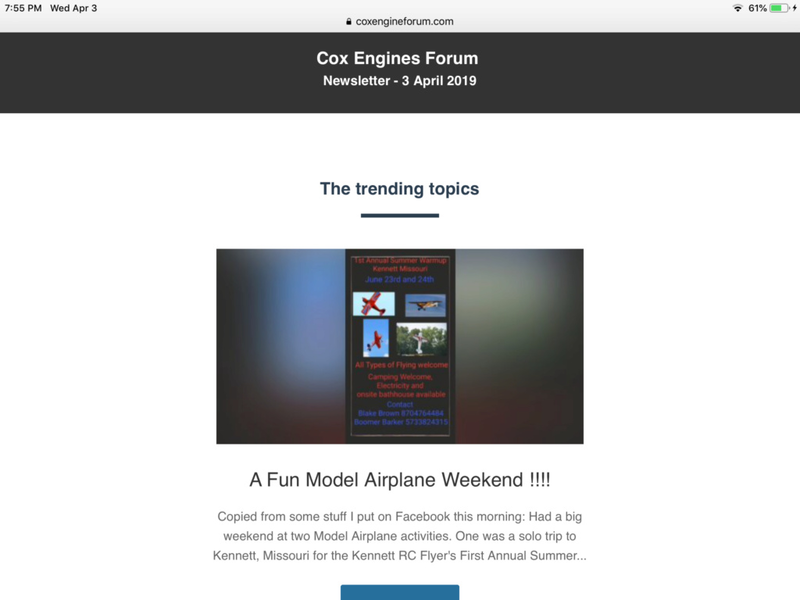 Did you get Cox Engine Forum Newsletter #3 ? Mine just popped up in my Email. Don’t recall getting #1 or #2. Nice to see a recap of current events and if sent to all members might get some inactive members to join in the fun. Those are automatically assembled and sent. I believe a new software update by the forum host started them. I believe they highlight the most popular topics. I'll have the take a closer look. We could write and send out actual newsletters if there was enough interest in writing them. It was tried in the past but it got difficult to find writers for new original content every month. I believe the same thing happened with Bernie's newsletter. Got mine, but curious - on my PC I get a sidebar labeled "Latest topics" showing all topic responses. But on my tablet I don't get the sidebar and have to hunt and peck.